This item is not available for purchase online. Please call (812) 275-7400 for more information. Per licensing agreements with SVP, Machines CANNOT be SOLD over the Internet, They must be, "In Person" sales. For this reason, Sale Prices cannot be listed, Price listed is the MSRP (Manufacturer's Suggested Retail Price) Come into the store or call for information on the latest promotion. The DESIGNER EPIC™ is the flag ship of the Husqvarna Line. 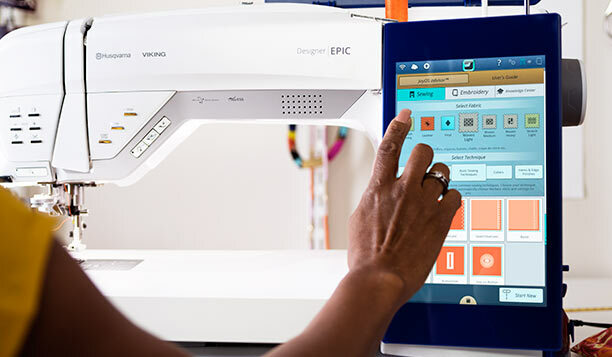 A sewing and embroidery machine tailors the sewing experience around your wants and needs through a Tablet-like screen, WiFi, 120 Step-by-step animated and illustrated tutorials, and much, much more. 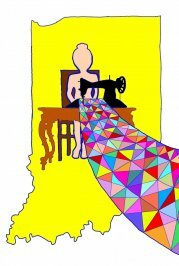 The result is a brand new sewing experience where your own creative exploration can come to life in special ways. Features over 650 Embroidery Designs, incorporating 30 specialty techniques. 7 embroidery fonts, each in different sizes, from 10 to 80mm. Note: The pattern for design E 017 on page 90 in the design booklet has been updated (01-15-2016). Over 1200 stitches, up to 54mm wide. 98 new stitches including Embellished stitches, Single Motif Stitches and Yarn Embellishment Stitches. 19 categories for easy selection. Exclusive patented stitch techniques. 6 sewing alphabets, with both upper and lower case letters, for easy programming. Complimentary Software (PC) to download, Soft cover for machine, Luggage style carrying bag with packing insert for embroidery unit, Foot control, Power cord, Needles, DESIGNER EPIC™ Sampler Book, Thread net (4), Universal tool, Seam ripper, Brush, Edge/Quilting guides, Bobbins (9), Thread cone holder (2), Hoop clips (16), Spool cap, small (2), Spool cap, medium (2), Spool cap, large (2), Large spool holder (2), Multipurpose tool/Button reed, Straight Stitch Plate. There are far to many features to list here. If you would like more information, Here is the link to the official Husqvarna Epic site. Call or visit the store for current pricing.